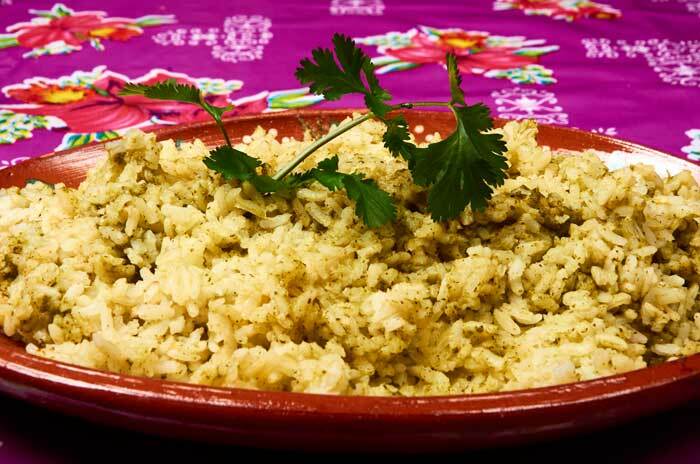 Mexican Green Rice, also known as cilantro rice is the perfect side dish and not just for when you are serving Mexican food. 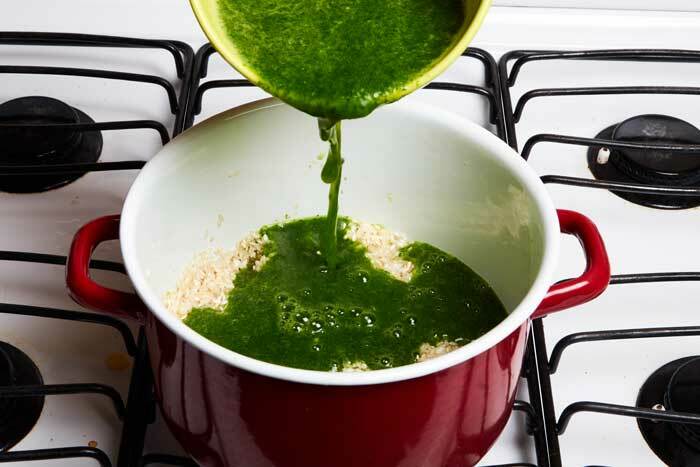 Its bright but not overpowering flavor goes well with fish or chicken. We also have a great recipe for Mexican Red Rice too. We prepared this dish with Morelos rice which is the only rice in Mexico with a Designation of Origin. To receive the designation it must come from the state of Morelos. 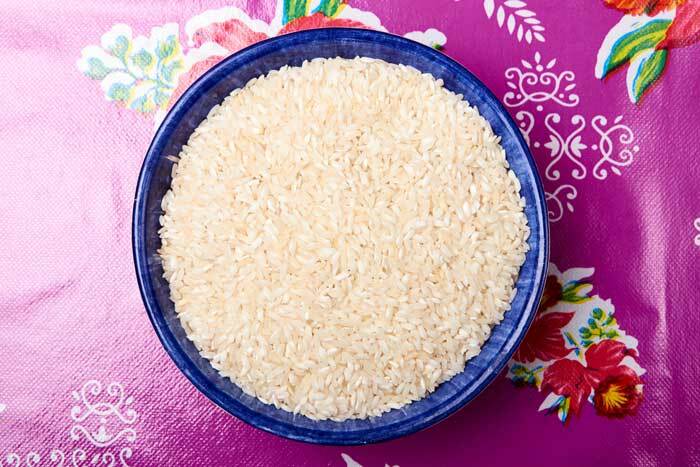 (More about the Designation of Origen) It is considered to be the highest quality rice in Mexico. At the supermarket, Morelos rice costs about 60% more. 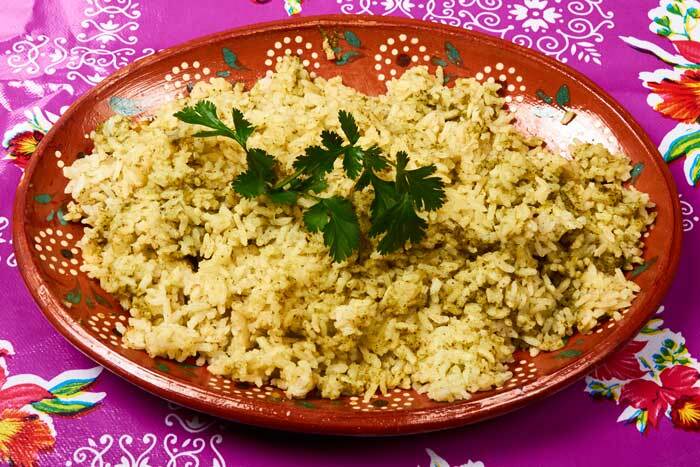 If you can’t find Morelos rice, this dish will turn out well with your favorite white rice. This recipe makes a large batch of rice, about 12 portions. We always like to make a big batch so that we have rice all week. You can cut the recipe in half if you don’t need so much. A few ingredients make surprisingly flavorful rice. Start by getting all of your ingredients together. 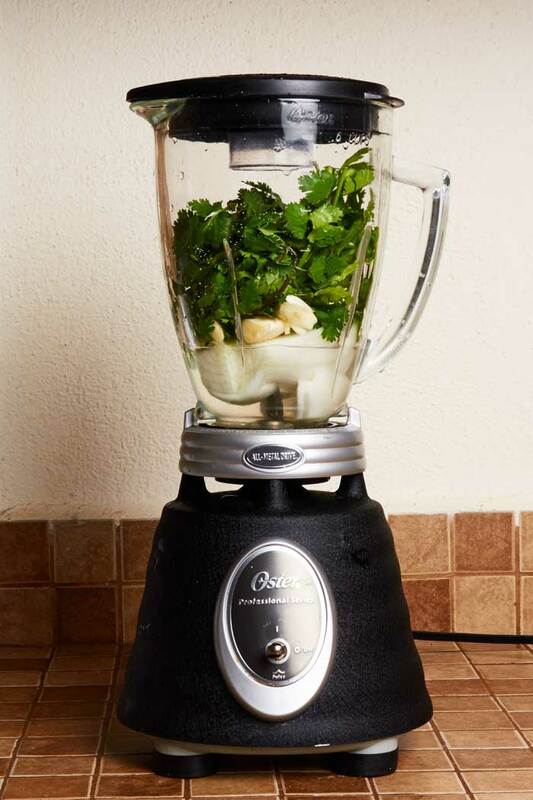 Add the cilantro, garlic, onion and 1/2 cup of water to your blender. Use the freshest cilantro you can find. It makes a big difference in taste. 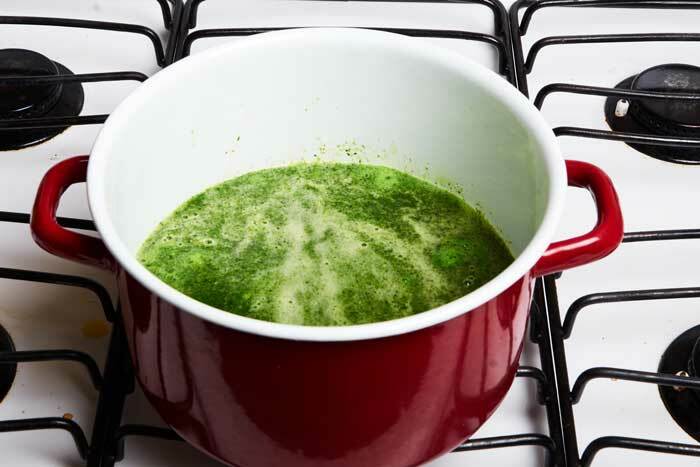 Before blending, discard any sprigs that are pale in color or have black spots. 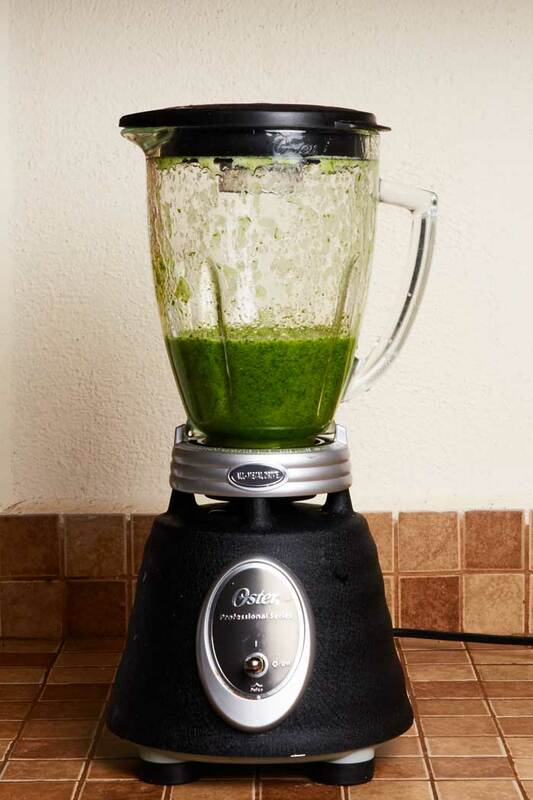 Blend the mixture for 1 minute until smooth. 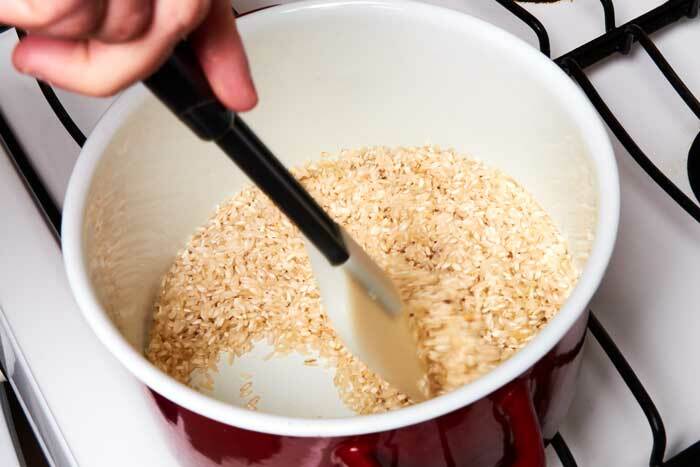 Pour the rice into a pan that has 2 tablespoons of medium hot preheated oil. This is an important step to build flavor and get the proper texture. The rice is coated in oil before cooking. Stir the rice to coat with oil. Keep stirring for about 30 seconds until the rice just begins to turn golden and become fragrant. Don’t let the rice burn. Stir continually so that it doesn’t burn. Pour the cilantro mixture into the rice. Add 4 cups of water and the teaspoon of salt. Stir once and reduce the heat to low. Add 4 cups of water and only stir one time. The rice will absorb the liquid as it cooks. It takes about 30 minutes to for the rice to fully cook. 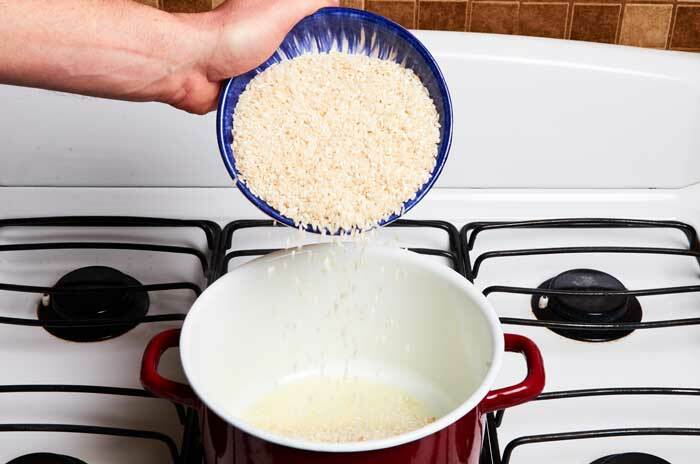 If the rice has absorbed all of the liquid and it hasn’t quite finished cooking add 1/4 of water at a time until the rice is cooked and all of the water has been absorbed. Getting perfect rice is an art. It may take you a few times to get it just how you want it. When the rice is cooked to your liking turn off the heat and fluff it with a fork. Let it rest 5 minutes and then serve. You will enjoy the results of this recipe. 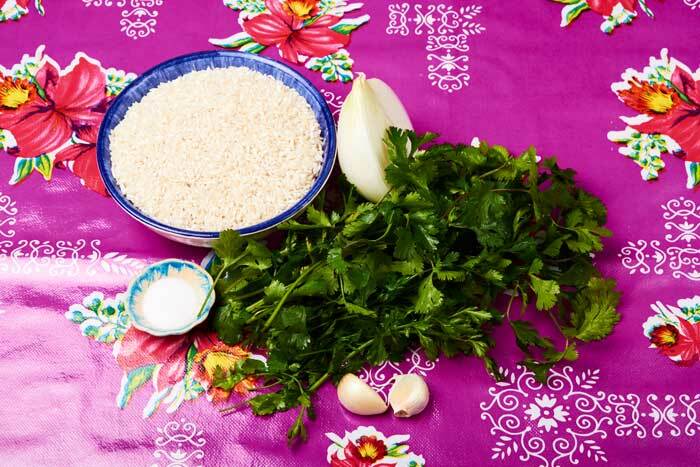 Recipe for Mexican green rice, also known as cilantro rice, a perfect side dish and not just for Mexican food. Its bright but not overpowering flavor goes really well with fish or chicken. Oh, this looks good. And the tidbit about Morelos rice being the only rice in Mexico with a Designation of Origin is pretty cool. I doubt I have tried it, but now I am gonna have to search it out. Jasmine is my rice on the regular (and buy it in 25lb bags), but love exploring the small differences between different rices. How much garlic for the Green Rice recipe? The recipe calls for 2 cloves of garlic. Thanks for pointing this out. Cheers! You are correct. It’s 2 cloves of garlic. I have updated the recipe. Cheers! I never cook rice uncovered. I am making this right now, but covered! You don’t specify to rinse the rice 1st. Cooking instructions on my bag of rice (Verde Valle brand) say to rinse. I’m going to go with my gut and not rinse. I’m thinking a hot pan with hot oil would not receive wet rice very well. I thought this was really delicious! I served it alongside hibiscus/potato tacos and refried beans and fresh tortillas! I kept it warm after cooking it by putting it in my rice cooker (can’t cook it in the rice cooker because it releases steam from the water, or in this case, crazy looking green smoothie! ).